Are you also one of these enthusiasts who check their ranking each morning before even opening emails, so they can see whether something has changed since the previous day? Tracking and monitoring your ranking for a specific keyword that is related to your business might be for some people just form of SEO gamification. However, it needs to be monitored, so you know how are you standing in your search results. 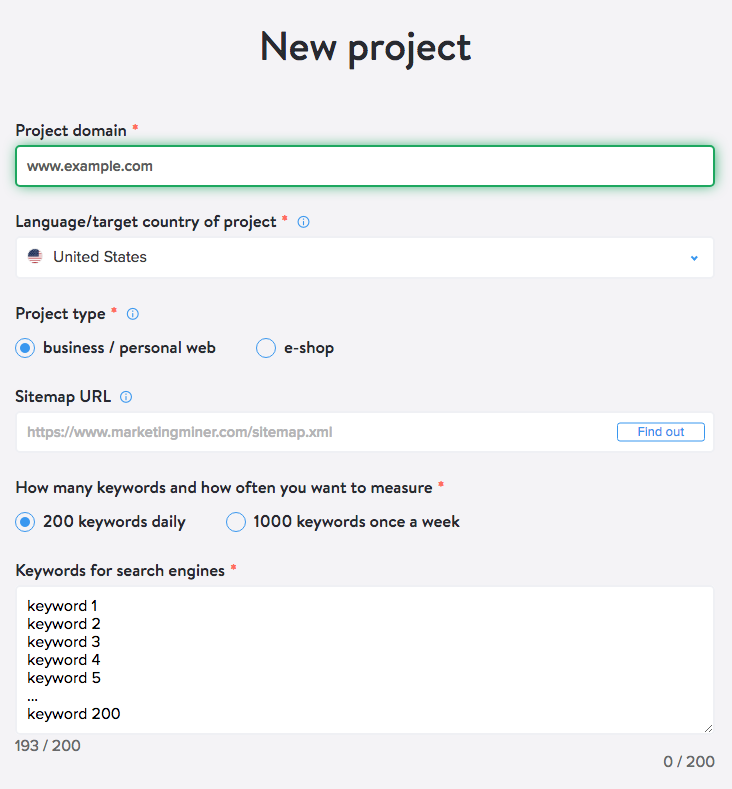 You will use regular monitoring of your rankings when you need to track specific keywords on a daily basis and at the same time, you need to track the development of your project within a certain time period. However, you can also add site of your competitors to Marketing Miner to see how they are doing in the search. If you see some significant changes in ranking for your competition, you can start investigating what changes they have made in on-page or off-page SEO. Now let&apos;s show you how you can conveniently track and monitor keywords on search engines like Google in Marketing Miner. For the daily or weekly rank tracking, it is necessary to create a new project. Sign in and go to the Projects section at the homepage. Click on Create new. Creating a project is simple and intuitive. Simply enter your domain, language, and project type. If you have a sitemap, you can add it to the project. Marketing Miner will then download the first 1,000 URLs from the sitemap and check regularly if all URLs are indexable. If you don&apos;t know right now exactly what keywords you want to track, don&apos;t worry. Just insert at least a few keywords, and then you can come back later and edit your keyword options. You can do that by clicking on "Project Setup" in the upper right corner of the specific project. Once you&apos;ve created your project, you&apos;ll see your dashboard, where you&apos;ll find a section SERP position - rank tracking. Here you can find search engines that are related to the country for which you have chosen to monitor rankings. You will find there Google in most cases. After clicking on a Google (or another search engine) you will reach the section where you will get all the necessary data. In this section, you will be updated daily (or weekly) with your ranking data. For individual queries, you can also view your development history, download bulk data about dropped or increased rankings or track project development in overall. If you have not gone into your own project and keyword setup yet, you can look at what the monitoring in Marketing Miner looks like. Once you decide to improve your rankings and integrate changes on the web, be sure to keep track of what impact these changes will have on your traffic. You should also have in mind that after you make these changes, it takes some time for search engines to crawl and reindex your content. That&apos;s why it is really necessary to regularly monitor rankings and its daily development. If these changes cause that your landing page is getting better in SERP, it&apos;s obvious that it had a positive impact. That&apos;s why it makes sense to continue what you did and apply changes to other content as well. If your ranking dropped, it&apos;s better to undo the changes and find out if your rankings dropped because of it or due to other reasons (such as updating the search engine algorithm). Additionally, do not only follow specific queries but the overall performance of the related landing page. Some changes may have a positive impact on a small part of the queries, whereby the overall performance of landing page might get worse.